55/45 Linen/Cotton Colour: Multi 41cm x 41cm Backing Colour: Plain A c..
Hand-embroidered Ivy Leaf 41 cm x 41 cm. 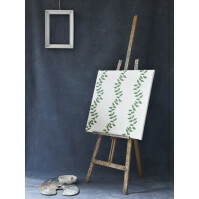 Plain Back 55/45 Linen/Cotton Dry..
Hand-embroidered Beech Leaf 41 cm x 41 cm. Plain Back 55/45 Linen/Cotton..